Pain-initiating function of glial cells identified for the first time. Pain hypersensitivity can spread to unaffected body regions immediately surrounding the initial insult. Sometimes it can even spread to the opposite site of the body or to large body areas and cause widespread pain. The sensation of pain occurs when neural pathways conduct excitation generated by tissue damage to the spinal cord, where the nociceptive information is extensively pre-processed. From there, the information is transmitted to the human brain, where the sensation of pain is finally created; this is the general belief. Now, a study from researchers from at MedUni Vienna’s Center for Brain Research shows that glial cells are also involved in clinically relevant pain models and their activation is sufficient to amplify pain. The team state that they have discovered a form of synaptic plasticity in the spinal cord that may explain the spread of pain hypersensitivity, a plasticity induced by the activation of glial cells. Previous studies show that glial cells are the commonest type of cells in the human brain and spinal cord. They surround neurons and are distinct from them, playing an important supporting role. For example, they are crucial for material transport, metabolism and the fluid balance in the brain and spinal cord. When glial cells are activated by pain they release messenger substances, such as inflammatory cytokines. Glial cells therefore have two modes, a protective and a pro-inflammatory mode. The current study shows that activation of glial cells results in a pain-amplifying effect, as well as spreading the pain to previously unaffected parts of the body. The current study shows that in the spinal cord there is a fundamentally different form of long-term potentiation (LTP) that is induced by glial cell activation, which travels long distances via the cerebrospinal fluid, and affects susceptible synapses at remote sites. Results show that the properties of this LTP resolve unexplained findings of memory traces in nociceptive pathways and may underlie forms of widespread pain hypersensitivity. The lab explain that learning and memory formation involve LTP of synaptic strength and a fundamental feature of LTP induction in the brain is the need for coincident pre- and postsynaptic activity. The group state that it is important to note that neuroinflammatory diseases of the brain, environmental factors and even the person’s own lifestyle can lead to activation of glial cells. They go on to add that examples from current literature are depression, anxiety disorders, chronic stress, multiple sclerosis, Alzheimer’s or diabetes, as well as lack of exercise and poor diet. They conclude that the properties of this gliogenic LTP resolve unexplained findings of memory traces in nociceptive pathways and may underlie forms of widespread pain hypersensitivity. The team surmise their findings show that the spread of pain is mediated by glial cells which diffuse widely, reaching the cerebrospinal fluid at biologically relevant concentrations. For the future, the researchers state their results give grounds for speculation that improvements in a person’s lifestyle could have a beneficial impact upon this system and ensure that they generally suffer less pain or minor niggles. They go on to add that thirty minutes of moderate exercise three or four times a week, a healthy diet and avoiding putting on excess weight could make a huge difference to managing pain. 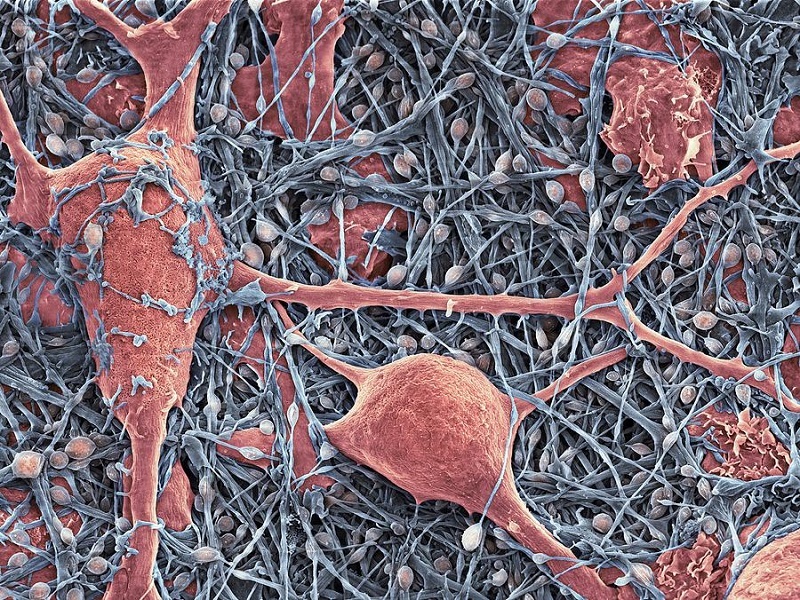 Nerve cells and glial cells, coloured scanning electron micrograph (SEM). The nerve cells have small cell bodies (blue/pink) and fine extensions called axons and dendrites (blue). The glial cells (red) have large cell bodies with thicker extensions. Neurons are responsible for passing information around the central nervous system (CNS) and from the CNS to the rest of the body. Glial cells are nervous system cells that provide the neurons with structural support and protection. Credit: Thomas Deerinck, Ncmir which was uploaded on May 8th, 2013.